Because activities and progressions are based on child development, parents register in the level appropriate for their child’s age. Preschool 1: We encourage the parent to participate until their child lets them know they can do it themselves (thank you very much). These preschoolers will have fun learning to get in and out of the water. We’ll help them jump into chest deep water. They’ll float and glide on their front and back and learn to get their faces wet and blow bubbles underwater. Preschool 2: These preschoolers learn to jump into chest-deep water by themselves, and get in and get out wearing a lifejacket. They’ll submerge and exhale underwater. Wearing a lifejacket they’ll glide on their front and back. Preschool 3: These youngsters will try both jumping and a sideways entry into deep water while wearing a lifejacket. They’ll recover objects from the bottom in waist-deep water. They’ll work on kicking and gliding through the water on their front and back. Preschool 4: Advanced preschoolers will learn to do solo jumps into deeper water and get out by themselves. They’ll do sideways entries and open their eyes underwater. They’ll master a short swim on their front wearing a lifejacket and gliding and kicking on their side. Preschool 5: These youngsters get more adventuresome with a forward roll entry wearing a lifejacket and treading water for 10 sec. They’ll work on front and back crawl swims for 5 m, interval training and get a giggle out of whip kick. Water Smart® educationAs an integral part of the Swim for Life® program, Water Smart education provides information and experiences that helps participants make smart decisions when in, on and around water and ice. Swimmer 1: These beginners will become comfortable jumping into water with and without a lifejacket. They’ll learn to open their eyes, exhale and hold their breath underwater. They’ll work on floats, glides and kicking through the water on their front and back. Swimmer 2: These advanced beginners will jump into deeper water, and learn to be comfortable falling sideways into the water wearing a lifejacket. They’ll be able to support themselves at the surface without an aid, learn whip kick, swim 10 m on their front and back, and be introduced to flutter kick interval training (4 x 5 m). Swimmer 3: These junior swimmers will dive and do in-water front somersaults and handstands. They’ll work on 15 m of front crawl, back crawl and 10 m of whip kick. Flutter kick interval training increases to 4 x 15 m.
Swimmer 4: These intermediate swimmers will swim 5 m underwater and lengths of front, back crawl, whip kick, and breaststroke arms with breathing. Their new bag of tricks includes the completion of the Canadian Swim to Survive® Standard. They’ll cap it all off with front crawl sprints over 25 m and 4 x 25 m front or back crawl interval training. Swimmer 5: These swimmers will master shallow dives, cannonball entries, eggbeater kicks, and in-water backward somersaults. They’ll refine their front and back crawl over 50 m swims of each, and breaststroke over 25 m. Then they’ll pick up the pace in 25 m sprints and two interval training bouts: 4 x 50 m front or back crawl; and 4 x 15 m breaststroke. Carry a 2.3 kg (5 lb.) object 15 m or yd. using swimmer’s choice of lifesaving kick. Demonstrate 25 m or yd. legs-only using swimmer’s choice of lifesaving kick. located at the halfway point. Swim 100 m in 3 min. or better (100 yd. in 2:40 min.) using any stroke or any combination of strokes of the swimmer’s choice. Head-up approach into surface dive to a maximum depth of 2 m. Swim underwater for at least 2-3 m or yd. to recover a small object. Surface and carry object to starting point. Swim 200 m in 6 minutes or better (200 yd. in 5:20 min.) using any stroke or combination of strokes of the swimmer’s choice. Carry a 4.5 kg (10 lb.) object 25 m or yd. using swimmer’s choice of lifesaving kick. Head-up approach into head-first surface dive to a maximum depth of 2 m. Swim underwater for 5-10 m or yd. and surface. Foot-first surface dive (maximum depth 2 m), recover an object and return it to the starting point. Swim 300 m in 9 minutes or better (300 yd. in 8:00 min.) using any stroke or combination of strokes of the swimmer’s choice. -Feed a baby or change a diaper? -Play games with children of all ages? -Prevent injuries and keep children safe? -Handle an emergency if one happens? A good babysitter knows all of these things and more. Learning them can be easy and fun with the Babysitting Course. 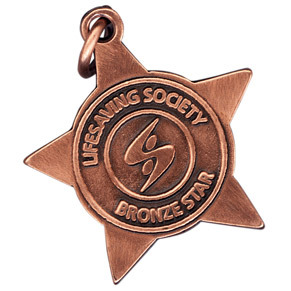 Bronze Star (10-12 hr. ): excellent preparation for success in Bronze Medallion. Participants develop problem-solving and decision- making skills individually and in partners. Candidates learn CPR and develop the lifesaving skills needed to be their own lifeguard. Includes a timed 400 m swim. Evaluation & certification: Current Lifesaving Instructors evaluate all items and certify candidates. 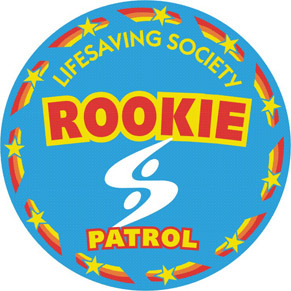 The Lifesaving Society deems its certifications to be “current” for 24 months from the certification date. Swim 400 m in 12 min. or better (400 yd. in 10:45 min.) using freestyle or any combination of strokes of the swimmer’s choice. 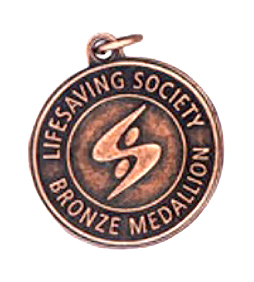 Bronze Medallion (18-20 hr. ): teaches an understanding of the lifesaving principles embodied in the 4 components of water-rescue education – judgment, knowledge, skill and fitness. Rescuers learn tows and carries, and defence methods and releases in preparation for challenging rescues of increased risk involving conscious and unconscious victims of various types. Lifesavers develop stroke efficiency and endurance in a 500 m timed swim. 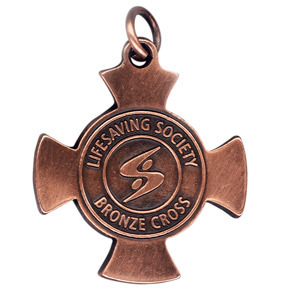 Evaluation & certification: Current Lifesaving Instructors evaluate most items, but only Bronze Cross Examiners may certify candidates. 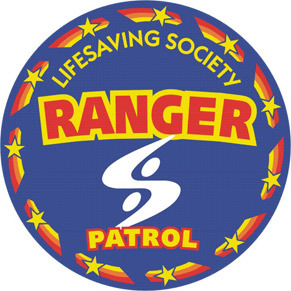 The Lifesaving Society deems its certifications to be “current” for 24 months from the certification date. *Swim 600 m or 650 yd. in 18 minutes or better using any combination of strokes of the candidate’s choice. *Demonstrate 2-rescuer adult, child, and infant cardiopulmonary resuscitation (CPR) on a manikin. National Lifeguard certification is Canada’s professional lifeguard standard. National Lifeguard training develops a sound understanding of lifeguarding principles, good judgment, and a mature and responsible attitude towards the lifeguard’s role. National Lifeguard training emphasizes prevention and effective rescue response in emergencies including first aid treatment. Candidates develop teamwork, leadership and communication skills. Fitness requirements include a timed object recovery, 50 m sprint challenge, 50 m rescue drill and 400 m endurance challenge. The National Lifeguard training program is designed for lifesavers who wish to obtain a responsible job and leadership experience. Successful candidates are certified by the Lifesaving Society – Canada’s lifeguarding experts. Standard First Aid provides comprehensive training covering all aspects of first aid and CPR. Workplace Standard First Aid incorporates all of Emergency First Aid and is designed for those who require a more in-depth understanding of first aid including: legal implications of first aid treatment, spinal injuries, heat or cold injuries, bone and joint injuries, chest injuries, and medical emergencies. Includes CPR-C certification. The first aid program is not restricted to aquatic candidates. Interested in working at the Bell Aliant Centre? Visit our “Join Our Team” page for information on required training/courses.